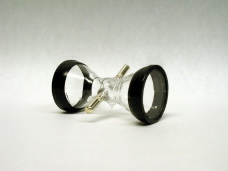 Ceramic reservoir cell which operates reliably up to 400º C. 21mm clear aperature with a length of 98 mm. Cell ends are V-coated on the outside to < .2% reflectivity. Water cooling of .5 lpm required. Cell has a Potassium reservoir. Cell is 14 mm in length and has 25 mm windows. 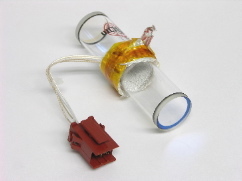 Cell includes coated nichrome heaters and RTD sensors. Heaters come pre-wired. Mounting tabs are epoxyed onto support pins. Ring cell used for high uniformity and relative immunity to shock. 21mm clear aperature with a length of 96.5mm. The outside ends are V-coated to less than 0.2% reflectivity. 17mm clear aperature with a length of 96.5mm. The outside ends are V-coated to less than 0.2% reflectivity. 19mm clear aperature with a length of 96.5mm. The outside ends are V-coated to less than 0.2% reflectivity. and has 25 mm windows with 21mm of clear aperature, 22mm windows with 19mm of clear aperature, or 20mm windows with 17mm of clear aperature. Cell includes heaters and RTD sensors. and has 50 mm windows. Back filled to 20 torr Krypton. Windows are optical grade pyrex. Scratch and dig. spec. is 10-5. Flat to better than 1/10th of a wave. Each heater is .6" and includes a 100 Ohm RTD sensor. 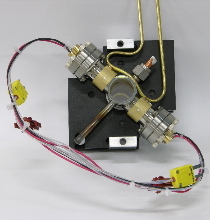 Heaters will work up to 300° C and hadle up to 1 Amp per coil. Typical rating at 255° C is 10 Watts at .6 Amps.